Hugely enjoyable superhero reboot that works surprisingly well, thanks to a sufficient number of changes to Sam Raimi's 2002 version, great special effects, a superb script, decent action sequences and a pair of terrific central performances from Andrew Garfield and Emma Stone. Directed by the aptly named Marc Webb ((500) Days of Summer), The Amazing Spider-Man is essentially a reboot of Marvel's Spider-Man franchise, taking the character back to high school and revisiting his origin story, only with a different villain and a new girlfriend. Andrew Garfield stars as high school outcast Peter Parker, who's been raised by his Uncle Ben (Martin Sheen) and Aunt May (Sally Field) since his mysterious parents (Campbell Scott and Embeth Davidtz) were killed in a plane crash. When he visits the lab of his father's old associate Doctor Curt Connors (Rhys Ifans), Peter is bitten by a radioactive spider and soon finds himself developing spider-like agility, reflexes, speed and proportional strength. After his Uncle Ben is killed by a criminal Peter failed to stop when he had the chance, he dedicates himself to a life of costume-clad crime fighting, naming himself Spider-Man and building a set of working web-shooters allowing him to swing around New York. 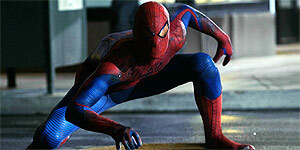 At the same time, Peter falls for classmate Gwen Stacey (Emma Stone), whose Police Captain father (Dennis Leary) has targeted Spider-Man as a vigilante, while Doctor Connors has injected himself with a lizard DNA enhanced serum intending to re-grow his lost arm and instead transforms into a scary reptile known as The Lizard. Andrew Garfield is a perfect Peter Parker, generating strong chemistry with Emma Stone's gorgeous Gwen Stacey and convincing both as high school science nerd and wise cracking costumed crime fighter (a strong element from the comics that was absent from Raimi's films). Ifans is equally good as Connors/The Lizard and there's terrific support from Martin Sheen as Uncle Ben, even if the film drops the “With great power comes great responsibility” line. Webb directs with style and energy, delivering spider-like details we haven't seen before (particularly in regards to the webbing), alongside the expected web-slinging and wall-crawling. He also delivers thrilling action sequences that are packed with detail, aided by some world class special effects (despite what was included in the trailer, The Lizard actually looks pretty good, while the CGI remains flawless throughout). The superb script gets the balance exactly right, delivering romance, laughs, tragedy, angst and superhero-based thrills in equal measure, as well as making some fan-pleasing corrections to Raimi's films, such as restoring real web-shooters. In fact, the only real problem is that a couple of key plot strands are left dangling, though these don't detract from the overall enjoyment. The Amazing Spider-Man is a hugely enjoyable, genuinely thrilling superhero adventure that ticks all the right boxes and justifies the decision to reboot the franchise in the first place. Highly recommended.